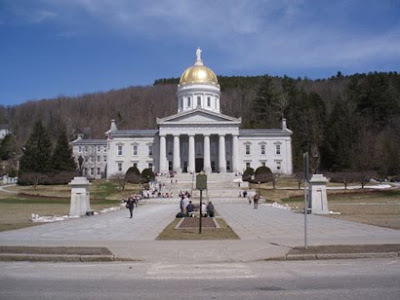 What is the only state capital without a McDonalds? Tonight (June 21, 2010) Katie Couric called Key West, Florida the "southernmost city in the U.S." That's so wrong. We have 50 states now, Katie! And Hawaii is WAY more south than Florida. That's a big goof. It's like saying Minnesota is the northernmost state. I hate to be rude, but that's just, like... well, kinda dumb. Geographic literacy is a problem in our country... but you'd think an evening news anchor would be familiar with all 50 states. Say it isn't so, Washington Post. On Sunday, the respected newspaper reported on recent efforts to make Washington D.C. the 51st state. The reporting was excellent, as usual.... but the headline suggested naming the state "Columbia." Really? Columbia? Isn't that name already taken--by a South American nation that's a major exporter of cocaine. And what about the fallout from Native American tribes who don't consider Columbus Day worthy of much celebration? Why not avoid all the negative ramifications and just call the potential new state "Potomac." That's my suggestion, anyway. 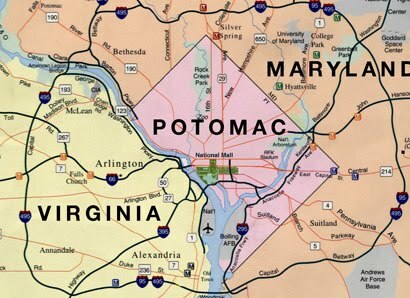 Read more in the "Potomac" entry in Lost States. So the big news in college football recently is Colorado joining the Pacific-10 conference. 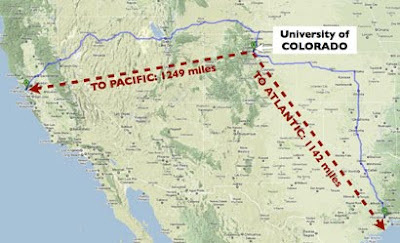 In it's quest for more money, the Pac-10 has gradually been expanding eastward over the years... now Colorado is apparently a "Pacific" state, even though the University is more than a thousand miles from the Pacific ocean. As my map above shows, the University of Colorado is actually closer to the Atlantic than the Pacific. If the eastward trend continues, Florida State will eventually end up in the Pac-10. It's actually funny to watch these conferences try to keep their traditional names--even when the name makes no sense. The Big 10 has 11 teams (soon 12)--the only thing weirder than that is Colorado as a "Pacific" state. ....the book's designer does, that is. Doogie Horner, who designed Lost States--and created the terrific cover--had a spot on America's Got Talent. The audience (apparently teleported from a 1st century Christians vs. Lions contest) wanted Doogie's blood... at first. But, in perhaps the most miraculous audience flip in comedy history, Doogie won them over. Don't miss his next outing. Susan Boyle, move over. On flag day you may have heard about mathematician Skip Garibaldi's computer program designed to figure out how our flag would look as we add more states. Garibaldi's program used the typical patterns we've used over the centuries... and allows you to click through all the possibilities. What's weird is that any state number would work just fine... EXCEPT 87 and 69. Those two numbers just can't be configured to work using traditional patterns. I guess we should name them the "Garibaldi Numbers"... for the guy who discovered this kryptonite of the American flag. Check out the interactive map for yourself. It's fun! Flag Day can make you rich! Monday is Flag Day - a holiday that originated just a few miles from my home here in Ozaukee County, Wisconsin. How can Flag Day make you rich? 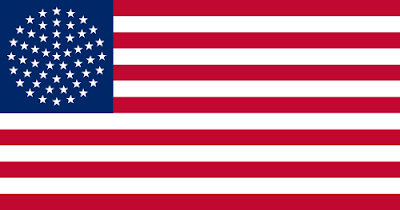 When America adds a 51st (and 52nd state) everyone is going to need new flags to display on Flag Day (...and Memorial Day, and the 4th of July....) So my best get-rich tip is to buy stock in a flag-making company. 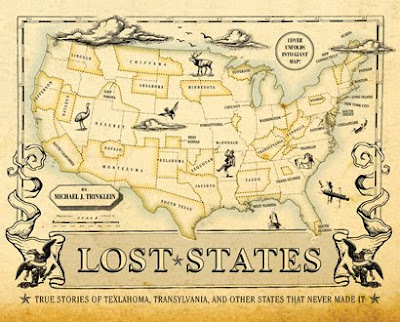 Because if you've read Lost States, you've learned that adding more states is inevitable. It's what we do as Americans. So get your shares of Anin and Company, the oldest and largest manufacturer of flags in the U.S. (And no, they didn't pay me anything to make this suggestion.) 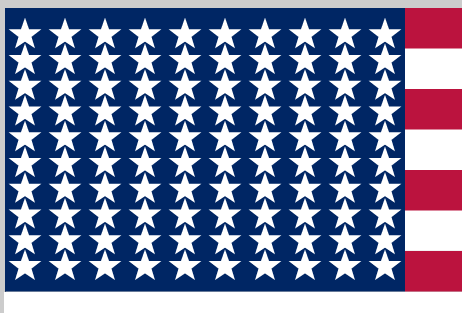 Above is the design I like for a 51 star flag. 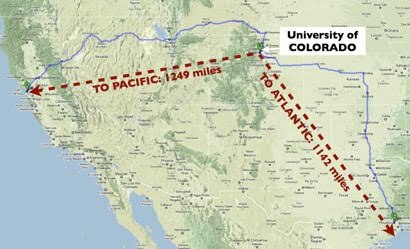 With everyone so concerned about Arizona's new immigration law, I'm surprised no one's talked about how we actually got our border with Mexico. 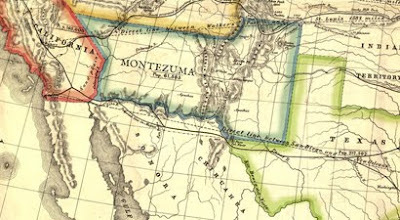 Before 1843, the southern part of Arizona and New Mexico was a part of Mexico. James Gadsden was instructed by the president to buy up a huge portion of Mexico, but our neighbor to the south balked. As a consolation prize Mexico did agree to sell us a small sliver, which we now call the Gadsden Purchase. Without that deal, Tucson would be in Mexico today. Of course Arizona wasn't a state back then--in the days before air conditioning, the population was small. When Arizona was considered for statehood, many proposed combining what is now Arizona with New Mexico to create a super-sized state called Montezuma. For a bigger map, go here. 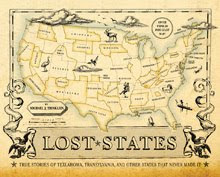 If you're here, you probably heard me on the radio today talking about Lost States. Feel free to explore the site... and of you'd like to get a copy of the book (Makes a great Father's Day gift! ), you should be able to find it at Borders. It's also at Amazon.com, many west coast Costco's... and Barnes and Noble. Enjoy!